Chicken and Black Bean Taco Salad makes lunch time, fun times! Chicken and Black Bean Taco Salad will energize and fuel you for the rest of your day! The chicken is superb and a great source of lean protein! Mixing it with black beans and leafy dark greens just makes it to die for! Yummmy!!! Chicken and Black Bean Taco Salad is filled with healthy goodness! The chips are baked with a little bit of chipotle cheese giving a wonderful kick to this healthy chip! Now… the moment you’ve all been waiting for… Wisdom from our wonderful Nichole! Nutrition and dieting is a topic that gets discussed a lot with my clients. During those discussions many of my clients walk away frustrated. Why? Because they don’t get diets or plans from me. Instead I talk to them about a way of life, I talk to them about making healthier choices, we talk about getting to know our bodies better, and we talk about it all in way that food fits into life instead of our lives revolving around food. This mind set is so hard for many people. We our a society that no longer is in tune with our bodies. We don’t know how to listen to our bodies tell us what food it needs, what food helps our bodies thrive. Instead we are a society that jumps from diet to diet, from food plan to food plan. Today’s fit tips or some tips to help you get more in tune with yourself. We are talking intuitive eating. 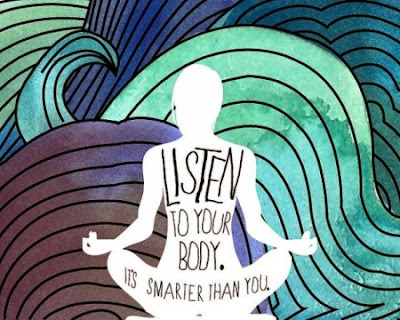 We don’t need to over thing every bite that goes into our mouths, instead we need to learn to let our bodies tell us what it needs, trust our bodies to be true and take out the constant negotiating and reasoning that so many of us put into eating. What does intuitive eating require? 1. Reject the diet culture. Quit trying to find the perfect diet or that quick fix. 2. Start using the hunger-fullness scale. Listen to your body tell you when it is hungry and when it isn’t. You will find that this is much harder than you realize. But if you can learn to really let your body give you hunger cues and cues that you are full, life will get easier. 3. Ask yourself what you want to eat. As your mind steps away from the diet frame this will be hard. But in giving your body the foods and nutrients it needs and wants you will find that it doesn’t want all the less-healthy food that you are scared of. Right now you crave that because you have told yourself you can’t have it. We tend to focus on the can’t and stop listening to the needs. 4. Practice mindful eating. Put the phone down at lunch time, turn the tv off, do whatever it is you need in order to be turn your focus on to your food. This will help you learn to enjoy your food more. It will also help you learn to become more aware of your fullness and find that sweet satisfied spot. 5. Turn off the food police and stop the guilt. We have so many shouldn’t and can’t ingrained in our brains when it comes to food, that needs to stop. This frame of mind is hard. I have been on so many band wagons throughout the years, I know how it goes. I found that as I strived to find foods that helped me feel better throughout the day or on my runs my mind settled more and more. When I quit running macro counts of everything in my hand or on my plate I was able to focus on what tasted good, what left me satisfied. And as I learned to eat what I wanted instead of focusing on a meal plan my brain was free to focus on my kids, my husband, and everything else in life that isn’t food. This has been a journey. It isn’t easy to retrain your mind and your body. But it is worth it. In a small sauce pan combine black beans and pico de gallo, cook 2-3 minutes over medium heat to warm through. Divide chips on two serving plates. Top with cooked chicken, black beans, and chipotle cheese. In small mixing bowl toss baby kale and olive oil. Add greens to serving plates. Serve with pico de gallo and Enjoy!